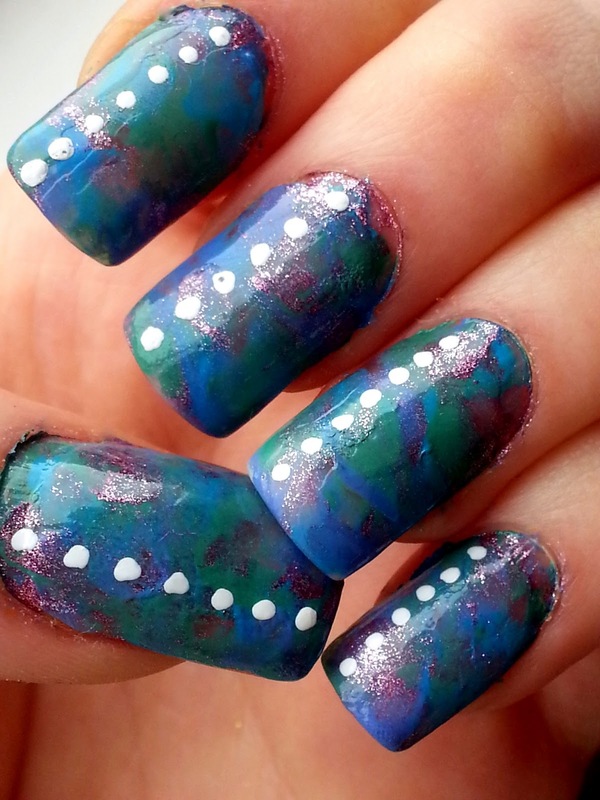 If you’re a fan of nail art then I’m pretty certain you will have heard of marbling or watercolour as its also known, nail art. The look is incredible, as it allows you to do some fantastic swirling patterns. It is achieved by dropping nail varnish onto the surface of a cup of water, and because of the density difference, it rests there, and you can manipulate it. 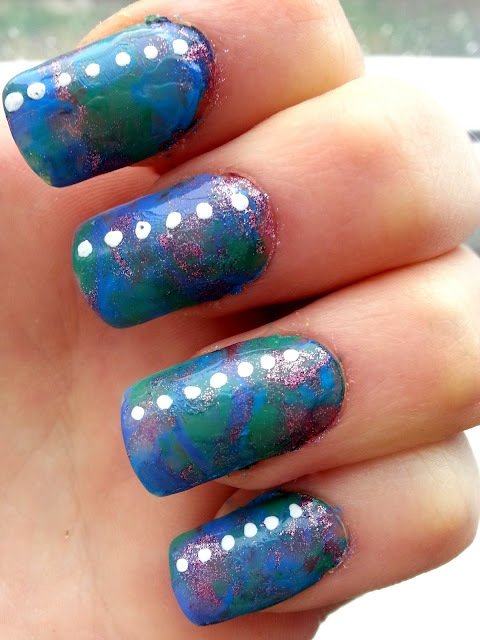 Then by dragging your nails through it, it transfers. I’ve watched countless videos, but let me tell you, it’s harder than those manicure gurus make out. Needless to say I wanted to come up with something easier. While my effect isn’t quite the same, it’s still got the wow factor. Keep reading to find out how your average house hold staple will be soon finding its way into your makeup draw. First unscrew all the caps off your varnishes so you can work fast. Then taking your first colour, (for example Barry M) drop about 4 substantial size blobs onto your nail in different places. 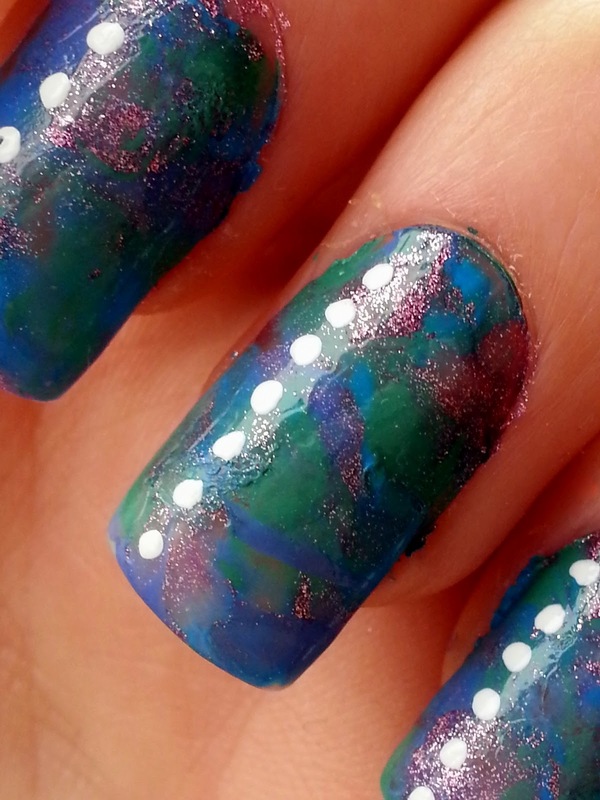 Then repeat the process with your other colours, dropping blobs in different places on your nail, so as the cover the entire nail with random blobs of colour. Quickly take your sandwich bag and carefully wrap around your varnished finger, try not to smudge the colour across wards, you want to press downwards instead. Hold it really taught for around 5 seconds, and then carefully peal back. Then repeat with all other fingers. The good thing is if you make a mistake you can just touch up with a slight dab of the end of your brush. Once dry, using your nail art pen, dot spots down the length of your nail starting on the outer third of your nail. I hope you find this a lot easier than the water marbling technique. I’m still determined to master it, so watch this space, but in the mean time this is pretty good. If you have any tips for me on the water technique (you clever sausage) then please let me know. Hi! I am a blogger from Slovak republic. I want to ask you to visit my blog ( http://sanni-zuzi.blogspot.sk/ ). I use slovak and english language, but the english language I just start using so there isnt big amount of the posts in two languages yet. I am working on it and I hope you will like it :). thank you :). These are so cute! I love the added polkadots! They look awesome! I tried marballing once, was so hard. Wish I could master it. Might try your method! These look great! I've tried marbling countless times, but always ended up with paint everywhere but my nails! Will definitely give this a go! This is seriously amazing, I'd love to be able to recreate it, but I'm so rubbish at nail art! Great idea and so much easier to just squish the colour on! It gives a kind of street-art effect, which I think is seriously cool.